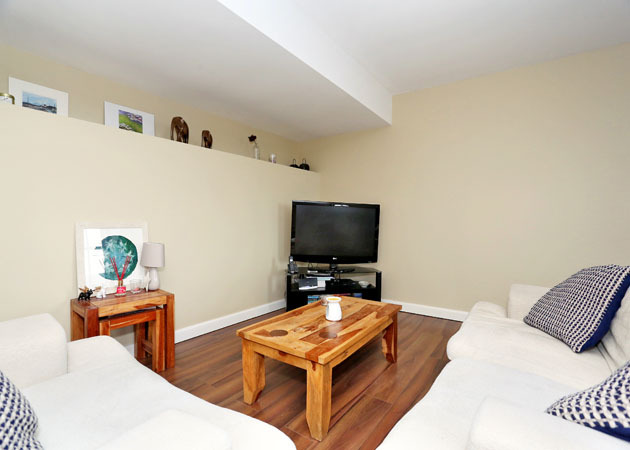 1 Bdrm 1st flr Flat. Hall. Lounge/Dining rm/Kitch on open plan. Bdrm. Bathrm (CT band - C). Parking. Fixed price £142,500 Entry by arr. Viewing contact solicitors. (EPC band - C). 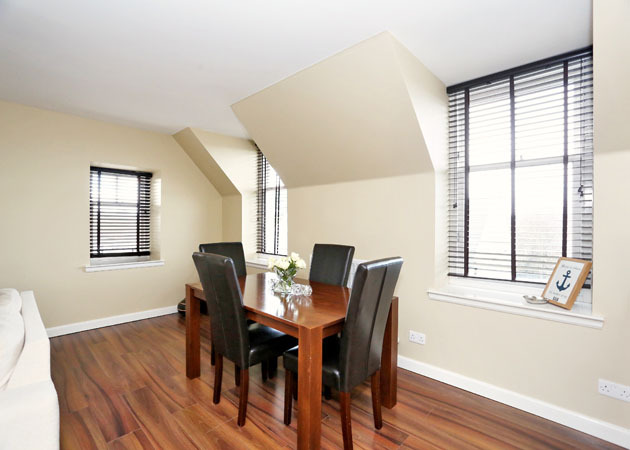 Forming part of an imaginative conversion and extension of the former “County Hotel”, this FIRST FLOOR APARTMENT forms part of a prestigious sought after development and is located within the original granite building. 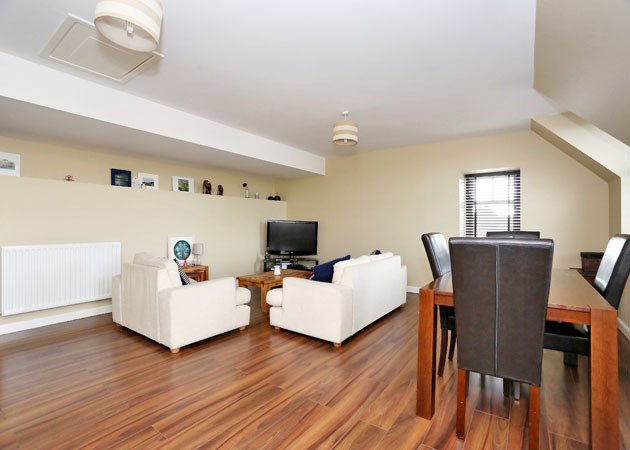 The apartment occupies an enviable position with the main living areas ideally placed to capitalise upon the sunny aspect and has been completed to a high standard of specification, which can only be appreciated by viewing. 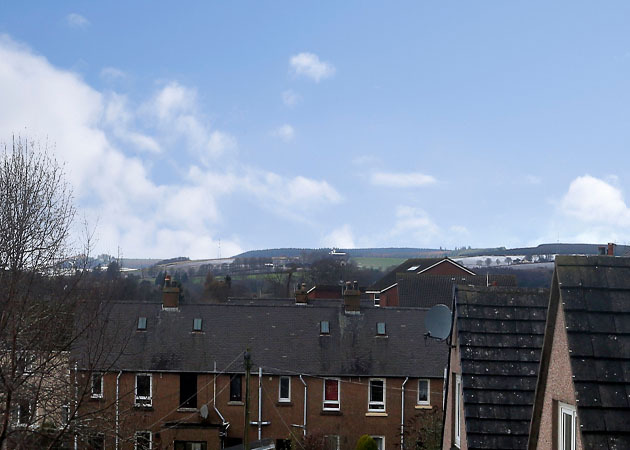 Amongst its added features the property enjoys the benefits of Gas Central Heating, Double Glazing, a beautifully appointed fitted Kitchen with numerous integrated appliances and there is also a modern Bathroom. This undoubtedly represents a rare opportunity for the discerning buyer to acquire an absolutely top quality apartment and move in with the minimum of inconvenience with the floor coverings, blinds and light fitments all being included in the price. 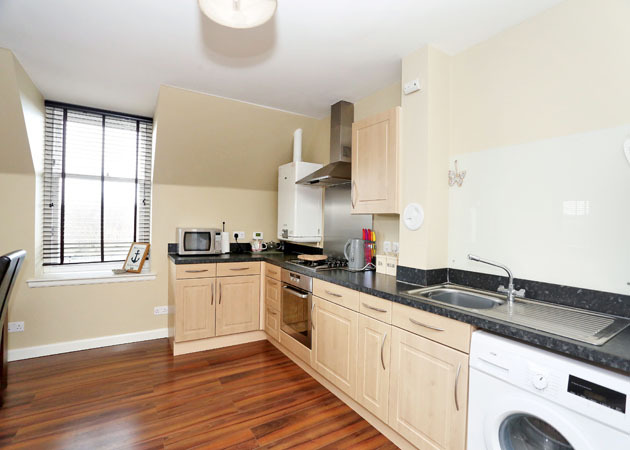 The flat is literally on a minutes walk from the train station making this ideal for commuting to and from Aberdeen. Stonehaven is a popular established costal town which is linked to AberdeenCity by good road and rail public transport facilities. The area is well served by shops and supermarkets, hotels and a wide range of leisure pursuits are available in the area including indoor and outdoor swimming pools, tennis courts, an 18 hole golf course and a large selection of sea based activities mainly centred round the historic old harbour. 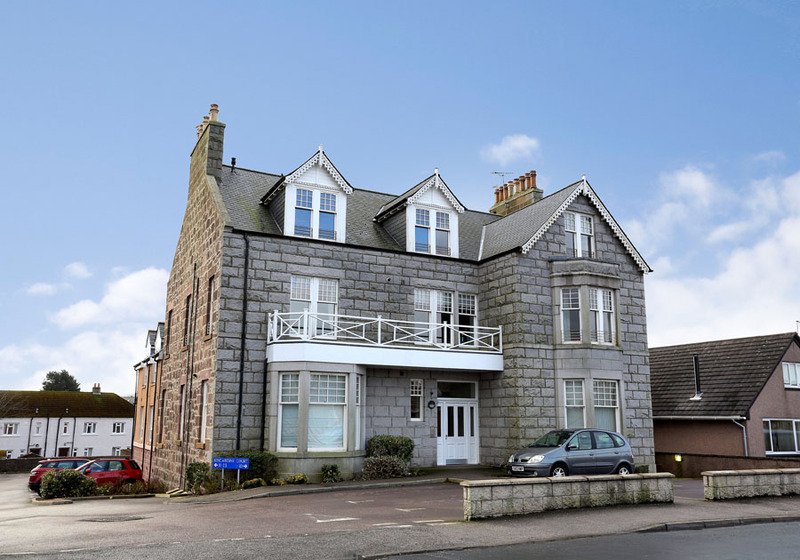 The location is also particularly convenient for those working at the oil related offices at Altens and Badentoy on the south side of Aberdeen. DIRECTIONS: From Aberdeen, head south on the A90 dual carriageway and take the first exit, where indicated, Stonehaven. Proceed to the first roundabout and turn first left and continue along this road for a considerable distance. Take the fifth left into Evan Street and continue straight ahead taking the fifth exit on the right into Arduthie Road. Follow this road round passing the Glennifer Bed and Breakfast and also the Adina Bed and Breakfast on the left and Kincardine Court is on the left hand side. 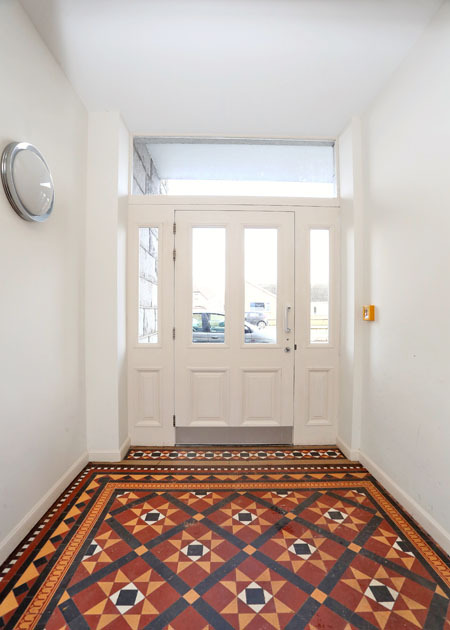 COMMUNAL HALLWAY: Large communal Reception Hallway, which offers a bright pleasant airy entrance to the front part of the development. ENTRANCE HALLWAY: Entrance Hallway set on two levels offering shallow cupboard housing the fuse box, 2 x light fitment, laminate flooring and carpet to stairs, smoke alarm. LOUNGE/DINING ROOM/KITCHEN ON OPEN PLAN: 20’1” x 19’10” approx. Lounge with open plan Dining area and Kitchen. Exceptionally spacious open plan living environment with dual aspect to the side and rear offering a quiet aspect. 2 x light fitment, TV point, telephone point, laminate flooring, fitted blinds. 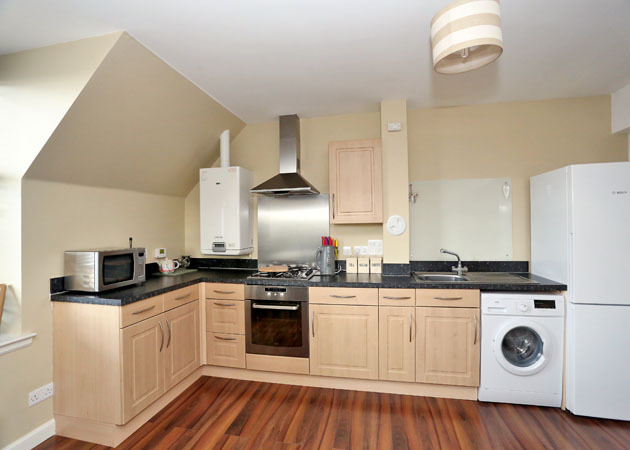 Modern Kitchen fitted with a range of quality units incorporating work surfaces with inset sink unit with glass splashback, built-in Oven, Gas Hob and Extractor Hood and the freestanding Fridge/Freezer and Washing Machine will be included in the sale. Hatch to loft space, wall mounted boiler. 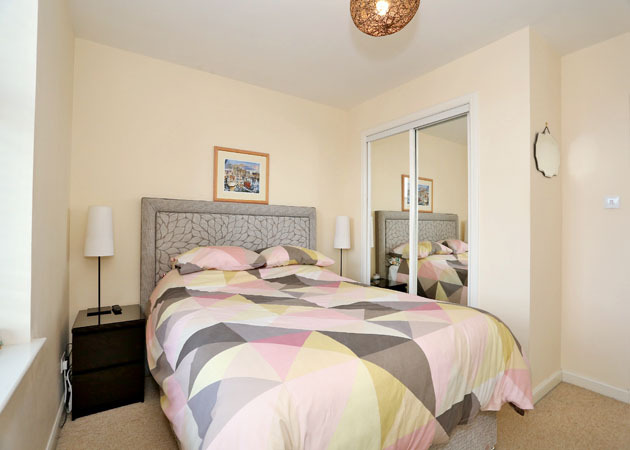 DOUBLE BEDROOM: 11’1” x 11’ approx. 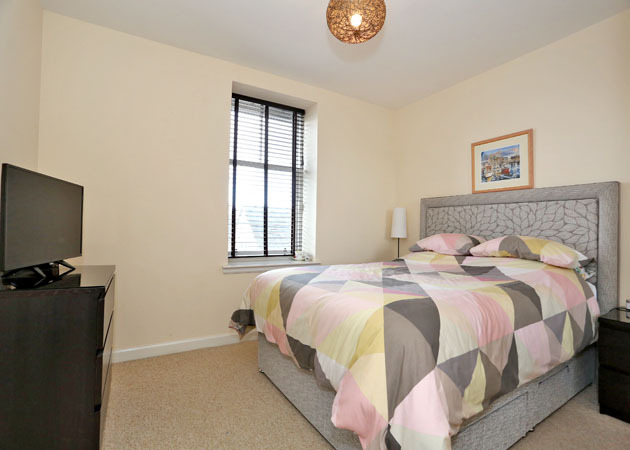 Good sized Double Bedroom to the side with the advantage of built-in wardrobes. Fitted blinds, fitted carpet, TV point. BATHROOM: 6’1” x 6’1” approx. 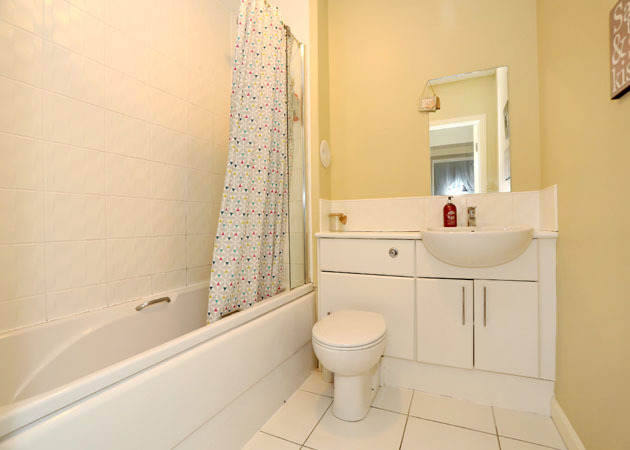 Centrally located, the Bathroom is fitted with a modern white suite comprising bath with shower over, w.c and wash hand basin set into vanity furniture. Light fitment, extractor fan, ceramic floor tiling. GENERAL: The floor finishes together with the blinds, light fitments and kitchen white goods are to be included in the price. OUTSIDE: Allocated parking space. Visitors parking. FACTORING: A Formal Factoring arrangement is in place for the upkeep of the building and development of which the property forms part including the landscaped grounds.